The Law Center, building 234, was located in this area of The Market Common. It housed the Staff Judge Advocate and the lawyers assigned to the judge’s staff. The building also contained the court room used in those cases involving trial by court martial. The Staff Judge Advocate provided legal advice and assistance to Commanders involved in handling various disciplinary and other legal matters pertaining to their personnel. The Staff Judge Advocate maintained liaison with local law officials. 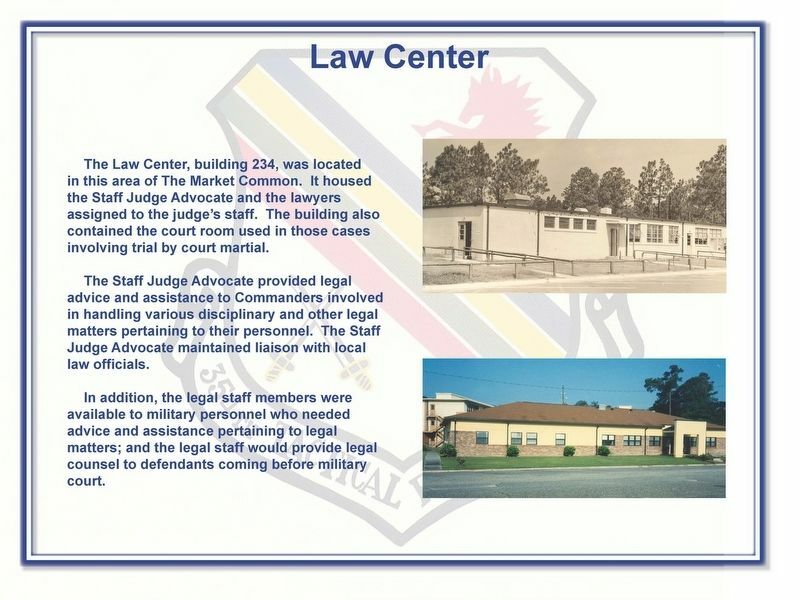 In addition, the legal staff members were available to military personnel who needed advice and assistance pertaining to legal matters; and the legal staff would provide legal counsel to defendants coming before military court. Location. 33° 40.117′ N, 78° 56.438′ W. Marker is in Myrtle Beach, South Carolina, in Horry County. Marker is at the intersection of Farrow Parkway and Nevers Street, on the right when traveling north on Farrow Parkway. Touch for map. Marker is in this post office area: Myrtle Beach SC 29577, United States of America. Touch for directions. of this marker); The Freedom Tree (about 300 feet away, measured in a direct line); Airman Dining Hall (about 300 feet away); Myrtle Beach Air Force Base Redevelopment (about 400 feet away); a different marker also named Myrtle Beach Air Force Base Redevelopment (about 400 feet away); Jack Walker (about 400 feet away); Dormitory Complex (about 400 feet away); a different marker also named Myrtle Beach Air Force Base Redevelopment (about 400 feet away). 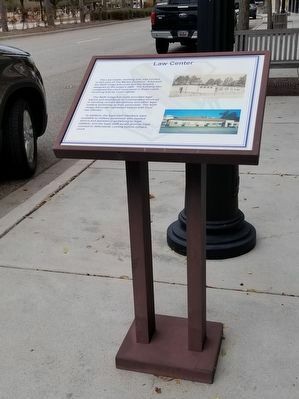 Touch for a list and map of all markers in Myrtle Beach. More. Search the internet for Law Center. Credits. This page was last revised on January 29, 2018. This page originally submitted on January 28, 2018, by Charles Keller of Myrtle Beach, South Carolina. This page has been viewed 51 times since then and 3 times this year. Photos: 1, 2. submitted on January 28, 2018, by Charles Keller of Myrtle Beach, South Carolina. • Bernard Fisher was the editor who published this page.